You must be a member of the Hamburg Afterwork Group to attend this activity. Would you like to join this group? Im pleased to invite you to such a nice event. Mariya Ando and her friends will take us on a journey through melancholy and lively musical worlds. East Europen music, works of Béla Bartók, Astor Piazzolla and Aram Khachaturian also wonderful Klezmer music will be played. 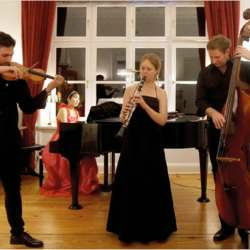 Anna Lena Lorenz, clarinet, Mariya Ando, piano, Babak Imani, violin and Matthias Groth, violoncello and contrabass. This is a charity event for the refugees, so the entrance is free but your tips are welcome. Very Important: Please and please switch your phones off, flight mode on etc., turn off all alarms etc. No talking, taking pictures and videos during the concert. After the concert pictures are welcome with the artists. Very Important 2: Please click attend only if you are going to attend. Do not take into account the waiting list, because people are having already alternative plans if they cant join the event, so your cancelling Protected content before doesnt really help. The concert is starting at 18:00 that is why I recommend coming like 15 minutes earlier, so you can say hi and take your seat, because when the concert starts, you trying to call me for directions/ finding a seat in crowd etc. will be futile. Check Protected content for your train/bus connections. Google maps for the streets/address. Add Protected content buffer to your arrival time because of getting lost/wrong turn/missing the bus/finding parking place etc. Every time I organize an event some people, somehow manage to be late 🤷‍♂️ , above funny warning is for them. PS: Feel free to bring friends/partner/company.